BANGKOK, Thailand, March 8, 2013 (ENS) – Wildlife poachers now are well organized criminal syndicates, and in response, wildlife law enforcement officers from around the world convened in Bangkok Thursday for the first global meeting of wildlife enforcement networks. The event was held alongside the conference of the 178 government Parties to the Convention on International Trade in Endangered Species, CITES, which continues through March 14. Officers from the 10 wildlife enforcement groups operating within Africa, Asia, Europe, and North and South America attended the meeting, together with others from networks proposed for Central Asia, West Asia and the Oceania/Pacific region. As a collective, proactive response of national governments, wildlife enforcement networks cooperate by sharing information on poaching and illicit trade activities, and exchanging best practice techniques on combating wildlife and forest crime. 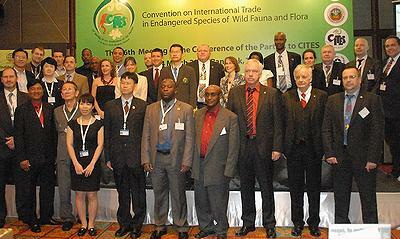 The meeting was hosted by the International Consortium on Combating Wildlife Crime, ICCWC, a collaborative effort by the CITES Secretariat, Interpol, the United Nations Office on Drugs and Crime, the World Bank and the World Customs Organization to strengthen international cooperation to combat wildlife and forest crime. It was made possible due to financial support of the U.S. State Department. At the meeting, officers shared their experiences combating poachers, heard about the ICCWC tools and support available to them, such as the ICCWC Wildlife and Forest Crime Analytic Toolkit, and planned to overcome challenges to national, sub-regional and regional cooperation. Wildlife enforcement networks hope to arrest poachers and illegal traders by operating across borders and organizational boundaries, coordinating the efforts of wildlife law enforcement agencies and other relevant authorities at a national, sub-regional or regional level. The report – produced by CITES, the UN Environment Programme, the International Union for Conservation of Nature, and the wildlife trade monitoring network TRAFFIC – was released March 6 at the CITES conference. It shows that systematic monitoring of large-scale seizures of African ivory destined for Asia indicates the involvement of criminal networks, which are increasingly active and entrenched in the trafficking of ivory. INTERPOL, the International Criminal Police Organization, is increasing the energy and resources it devotes to fighting wildlife crime, including ivory trafficking. On Thursday, INTERPOL released a report on the illegal online trade in ivory that shows a total of 4,500 kilograms of ivory in hundreds of items worth 1.45 million euros for sale on Internet auction sites across nine European countries during a two-week period. During Project Web, supported by the International Fund for Animal Welfare, the details of 660 advertisements on 61 auction sites were analyzed by specialist national agencies and departments. 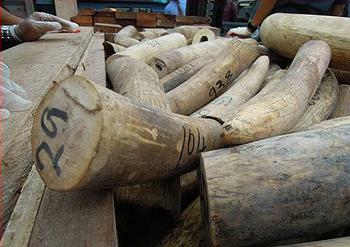 With few obligations on sellers to prove the legality of ivory, and previous IFAW investigations showing that ivory is the most widely traded wildlife product on the Internet, the INTERPOL report recommends the introduction of e-commerce specific legislation and strong collaboration with customs to investigate and prevent the illegal online sale of ivory. “Whether in the real or virtual world, the illegal ivory trade poses one of the biggest threats to elephants in the wild, and law enforcement efforts need to be both off and online if we are to effectively tackle this crime,” said David Higgins, manager of INTERPOL’s Environmental Crime Programme. “Enforcement efforts against online wildlife crime are still in their infancy and face new challenges, but the support shown by the countries which took part in Project Web and the recommendations for future actions are a strong base from which to develop a collective response to this serious problem,” said Higgins. On February 26, INTERPOL launched Project Scale, a global initiative to detect, suppress and combat fisheries crime. The project was launched during the first INTERPOL International Fisheries Enforcement Conference at Interpol Headquarters in Lyon, France. 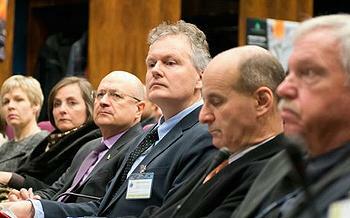 The conference was followed by a two-day meeting of the first permanent Interpol Fisheries Crime Working Group. Illegal fisheries are estimated to cost the global economy up to US$23 billion a year. INTERPOL says fisheries crime is linked to other forms of serious transnational crime including corruption, money laundering, fraud, human and drugs trafficking. Funded by the Norwegian Ministry of Foreign Affairs, the Norwegian Agency for Development Cooperation and The Pew Charitable Trusts, Project Scale will coordinate operations to target this criminal activity, disrupt trafficking routes, ensure the enforcement of national legislation and harmonize national and regional enforcement efforts.